"Instantly Burn The Arabic Alphabet Into Your Mind!" Learning Arabic can be frustrating at times, especially with a writing system so complex. Do you want to learn how to read and write Arabic, but are completely hair-pulling frustrated by traditional rote learning? What if I told you a method existed that uses a unique, one of a kind approach to not only memorizing but using the Arabic script in just a few hours? I still remember the frustration of spending months in expensive classes with virtually no results to show for. All those little squiggles and lines just wouldn’t get into my head, no matter how hard I tried or how many times I copied out by hand each letter. Fortunately, I found a revolutionary new learning technique that makes learning the Arabic alphabet effortless and enjoyable. This e-book is a complete course for learning the Arabic writing system with a painless, fast, and unique method. You’ll be writing your first words within minutes! After just a few hours you’ll have mastered all the letters and their shapes, and know exactly how to put them together to form complete words. You’ll also know the precise order of the Arabic alphabet and be able to read some Arabic calligraphy. Guaranteed success: This course comes with an iron-clad 30-day money back guarantee. Instant download: This e-book can be on your computer in minutes! Free bonus: complete Volume I of FSI Modern Written Arabic with over 17 hours of Audio recordings! I have now purchased and downloaded the book and it is truly an amazing way to learn the Arabic alphabet. All Arabic books teaching the Alphabet which I have come across so far have introduced it the way you would to an Arabic speaker. Yours is the only one that does it from a non-native speaker’s perspective. I was delighted to find your method since without it I fear I would still be staring at tables of hieroglyphics that made no sense. I am surprised that my fear of trying to decipher the script is now gone. I just want to say that I have learned a lot about the pronunciation of letters and writing within hours of using your program and I’m glad I purchased this product instead of Rosetta Stone. It saved me a lot of money. […] I would highly recommend this program to anyone starting out Arabic as the alphabet is a very important thing to learn first when starting your journey on a second language especially with a language like Arabic which is far different than Roman languages. Arabic Genie turned out to be a much better program than I expected. It takes things that make total sense to Arabs, but not so much sense to English speakers, and explains them in a way that is perfectly logical and simple. Let me demonstrate the power of the method to you now and prove to you that you can learn your first Arabic letter in the next 3 minutes. Look at the example on the right. You see the Arabic letter for “n”, below the letter you see a person with a big belly and a visible navel. Now, close your eyes and visualize the image in your mind for a few seconds. Whenever you will see the Arabic “n” you will immediately think back to the big belly with the navel, which in turn reminds you that the shape you see before you is the Arabic “n” sound. As you can see this method does NOT rely on hours of excruciating rote memorization. It is a fun and easy way to start out on your language learning journey. The Magic Key To The Arabic Alphabet contains a memory image and complete explanation for every single one of the 28 letters of the Arabic alphabet. The book also contains exact demonstrations of the way the Arabic letters are drawn and extensive fun exercises that help you learn to write complete words in no time at all. This is a completely unique method. You won’t find this taught anywhere else. That’s why I want you to click here right now and buy your Magic Key To The Arabic Alphabet! It’s a digital download and will be on your desktop in minutes. I had purchased the Arabic alphabet from you previously and I’m glad to say that it’s worked wonders for me. Your method is marvelous. I’m on my third year of Arabic and my knowledge of the language is up to par. I’ve “gone native” in many parts of the Middle East: drinking tea with Bedouins in Syria, living with Arab families and working in Egypt. Now, you too can experience success in Arabic, when you apply the techniques I teach. Reason one: I’ve got a real passion for Arabic and the Middle East and have travelled to many countries in the region. I’ve also done research in Arabic at the University of Cambridge and have an MA with distinction in Middle Eastern Studies. Reason two: My language skills are practical and have been tested many times. That’s why I was able to develop a no-fluff method that burns the Arabic language into your long-term memory. Reason three: I’m also a serial language learner and speak fluent German and Spanish as well as conversational Chinese, French and Persian. This means, I know exactly how language learning works and how learning Arabic can be made easy for you. This experience gives me a unique insight into how the language works and how you too can learn Arabic in the most efficient way possible. In the Arab World everything is written in Arabic! And by everything I really mean everything. Ever entered the wrong restroom because you couldn’t read the sign on the door? Well, I can tell you it’s not pleasant. Having a grasp of the written word will enable you to progress beyond the basics very quickly. Sure, you can learn a few phrases without knowing the Arabic alphabet, but as soon as you want to progress beyond the “Hello, me hungry” type of sentences you will need to learn to read and write. Reading is an extremely important part of learning a language that helps you assimilate the foreign words and structures much faster than simply relying on audio. In summary, learning the Arabic script is the first crucial step towards fluency in the language! After completing the course you will effortlessly have mastered all 28 letters of the Arabic alphabet with carefully-crafted memory associations that will burn the Arabic letters deep into your long-term memory. This type of associative memory goes back to the Ancient Greeks who successfully used this proven technique to memorize thousands of verses. Now you can harness the same techniques to propel your Arabic to a new level. Be able to read and write complete Arabic words and sentences. Through the extensive illustrations and fun exercises you’ll be able to recognize how each letter is drawn, both in printing and in handwriting. You will learn how to decipher real-life examples from Arabic masterpieces of calligraphy. Instant results! There will be tangible, real rapid progress after only a few minutes. This chapter introduces you to the fundamental rules of the script. In this chapter you quickly master all the letters with my special memory technique. Learn a few additional signs that are not strictly part of the alphabet itself, but are nevertheless necessary. You’ll learn exactly how to use the short vowel signs that are found in the Koran and childrens’ literature. In Chapter 5 you proceed to use your skills to write and recognize actual Arabic words. This essential reference chapter summarizes the letters, their shapes, sounds, and memory images. With a special memory technique you’ll commit the order of the letters to memory without any need for rote learning. I show you real life examples of Arabic calligraphy and give you a special technique with which you can decipher these “riddles”. Unlock the Arabic language right now with The Magic Key To The Arabic Alphabet! It’s available as an instant download, so it can be yours within minutes. The Magic Key To The Arabic Alphabet is a digital e-book. You’ll instantly download it as an easy-to-use PDF file, which opens like the pages of a book on all Windows and Mac computers. It can also be printed out for ease of reading. After your payment, you will be taken to a download page where you can get your report with a click of your mouse. It’s that easy! Arabic classes might cost you anywhere between $35 and $100 per lesson. With traditional (slow and painful) methods it could take you as much as 30 lessons to master the writing system (if you don’t give up before), spread out over weeks. That would cost you between $1050 and $3000! Plus, consider all the lost time spent on laborious rote memorization. This e-book used to cost $47, but I have slashed the price to just $27 (USD) to make it even more accessible – please buy your copy soon before the price goes up again! 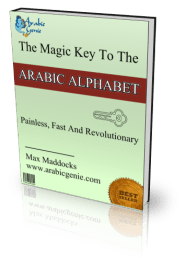 Think of how much money and hardship you will save by investing $47 only $27 to receive instant access to The Magic Key To The Arabic Alphabet. Click here to kickstart your Arabic now! Because I want you to make the right choice for your Arabic language success, I have secured an incredible free bonus for you. When you buy right now you’ll receive this bonus at absolutely no extra cost. FSI Modern Written Arabic is one of the most complete Arabic courses in existence and was developed by the Foreign Service Institute (FSI) for the United States government to train US diplomats and secret service agents. Retails for $325 on other websites…yours free for ordering today! AND your free copy of FSI Modern Written Arabic Volume I. Both are instant downloads…you’re only 3 minutes away from learning to read and write Arabic! All of that is yours for the low one-time investment of $47 only $27. I bought your ebook The Magic Key less than a week ago, and I’m already reading Arabic! Of course, I’m still quite slow, but I cannot believe how quickly and easily this has worked, and I look forward to making progress at a rate I never thought possible. You’ll be reading and writing Arabic within hours… GUARANTEED! Because I am so confident that this system works for you, I have an unconditional 30-day money-back guarantee. If for any reason you don’t think this book is for you, simply send me an email within 30 days after purchase and I will personally send you a full refund, no questions asked! This means your purchase is completely risk-free! To buy The Magic Key To The Arabic Alphabet just click the button below! I’ve removed all the hard work from learning this beautiful language. Stop trying to learn from methods that just don’t work! I wish you all the success with your Arabic learning journey. P.S. If you are looking for an easy, painless and effective way to learn the Arabic alphabet, this book is for you! P.P.S. Don’t forget my ironclad, no questions asked, money back guarantee. You have a full 30 days to test drive the entire system and if you are not completely satisfied with your purchase I will refund 100% of your money. So what are you waiting for? Take action now!